2016 Presidential Election: Where do we go from here? Video of 2016 Presidential Election: Where do we go from here? Updated Nov. 15, 2017 1:57 p.m.
USC Annenberg students, faculty and staff woke on Wednesday morning to one of the most historic and surprising outcomes to a presidential election in memory, with Republican nominee Donald Trump winning against Democrat Hillary Clinton for the highest office in the land. On a startlingly close election night, Trump beat Clinton by 51 electoral votes. Republicans also held onto the Senate with 51 seats. 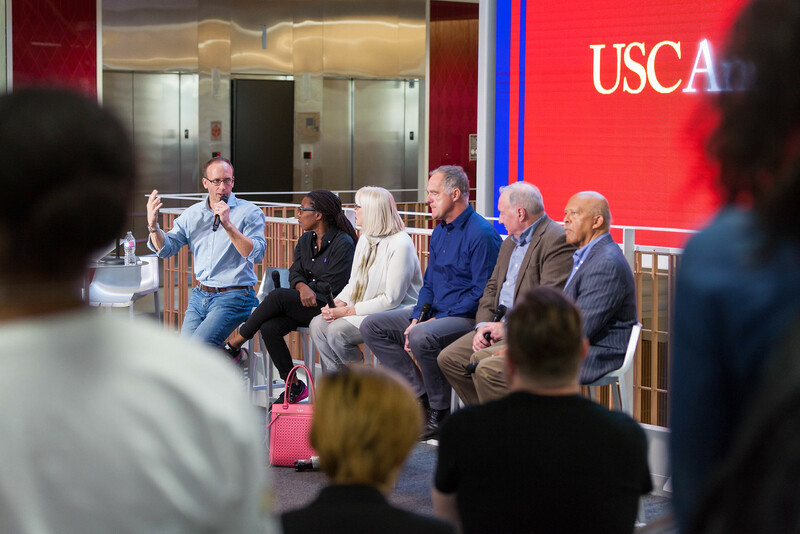 On November 9, School of Journalism Director Willow Bay moderated a discussion of the event--titled “The 2016 Presidential Election: Where do we go from here?”--in a packed Wallis Annenberg Hall lobby with Dean Ernest J. Wilson III, professors Gabriel Kahn, Philip Seib, Jonathan Taplin, Judy Muller, Burghardt Tenderich, senior lecturer Mary Murphy, lecturer Miki Turner and School of Communication Director Sarah Banet-Weiser. The group discussed the significance of communication and journalism schools moving forward, race relations and the importance of media literacy. 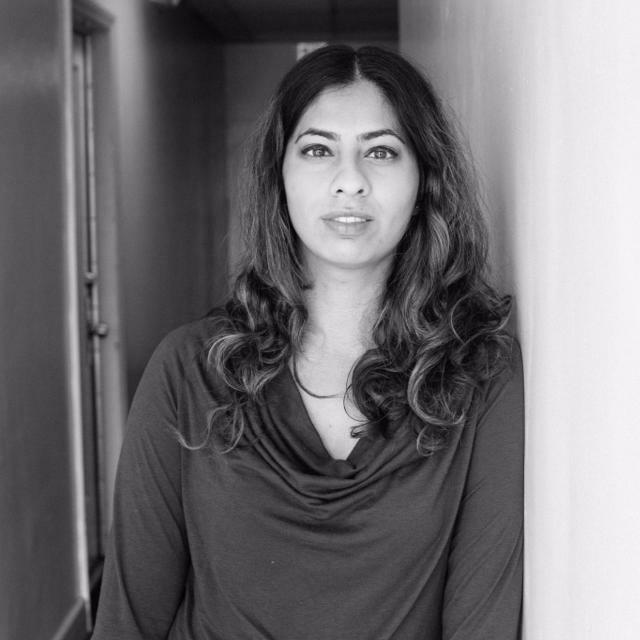 “I am struggling because I spent my entire professional life believing that reporting accurately about complicated issues has a benefit for society and democracy, and that it also has an economic value. And I think that’s all in question now. The fact that a Presidential candidate had three or four newspaper endorsements including one from the KKK paper... So many of the pollsters blew this one and the media was predicting a completely different outcome. So is media relevant anymore? Legacy institutions, whether it’s the Republican and Democratic parties or large media organizations, are all really challenged at this moment, challenged for their relevance and the way they resonate. “I think this is a shot across the bow for journalism schools. This is a real awakening on how important this job is. I’m talking about being the watchdog as you will be going out at a time when all branches of government are controlled by one party. This is what the press was born to do. As Thomas Jefferson said, 'If I had to choose between a country that had no government and a free press or no press and a free government, I would choose the no government and free press.' That’s how important it is. You have to ask the tough questions, speak truth to power. You can’t be timid. You've got to ask questions that might seem embarrassing at the time, you have to call people out. “First off, they need to decide how to cover America better. One of the things that was clear in the reporting in the run-up to the election was there was the standard menu of coverage that would cite employment statistics, which are pretty good, gross domestic product, that’s pretty good. Lots of good news. They never really got to the core of the dissatisfaction. That’s what the drove the Trump candidacy. In terms of covering what America is, journalists will have to give a lot of thought to exactly what criteria they're looking at. Obviously, there’s a tremendous amount of anger out there, a tremendous amount of fear, and the news coverage, for the most part, missed all of that. Another thing the news media need to do is cover America in the world. This was an 'America First' campaign. It was an isolationist campaign on the part of Trump. I would argue that’s unrealistic in terms of a globalized world these days, in terms of economy, defense issues and climate issues. That has not sunk in with the public. In the interim between the Cold War and today, the news media, both institutionally and in terms of the substance of their coverage, have not kept up. As Judy said, we have to be very forward looking in all of this. Dean Wilson on asking ourselves what did we miss in the election? “Why were we so wrong? It’s also pollsters who were really, really wrong. Did we get the analytics wrong? Or the detailed analysis, was that the problem? Or was it the framing of the problem? Was it more normative? Was it more about empathy? Secondly, to echo what Phil said, we operate in a global economy in terms of trade and national security. I was reading The New York Times today and there was an article there that said foreign leaders supported Trump’s opponent on a 10 to one basis. What that suggests is that all of us should pay pretty close attention to the diplomacy language the new administration uses to try to address that deficit. What does this mean for the Annenberg School? As a Dean of the School, I would welcome all of you to think about that. I hope this won’t be the last discussion that we have on this issue, but I think existentially we have got to ask what can we do as teachers and students and citizens so that we have a better understanding moving forward. Shouldn't that be engraved into the heart, into the DNA of the Annenberg School? I think we do a pretty good job, we do a very good job, but we have got to do better. Everyone has got to do better. “I think journalists got it wrong from the moment he came down that elevator and made his announcement. Because when he did that I was talking to the Mark Burnett people. They said Trump is doing every single thing that we trained him to do as a celebrity. Donald Trump had the best media training of any person who has ever run for office.